Paul is rescued from the multitudes who worshipped the goddess Diana. OT ALL PEOPLE in Ephesus believed in Jesus when they heard Paul's preaching and when they saw the miracles he performed in Jesus' name. Many still went to the great temple of Diana to worship the image of that heathen goddess, which they believed that had fallen from the sky. Those who could not go to the temple of Diana everyday wished to have an image of the idol in their homes. And heathen worshipers who came from other lands wished also to carry away with them a likeness of the huge idol which stood in the beautiful temple of Ephesus. Not because this idol was pretty, for Diana was not at all pleasing to look upon, but because they worshiped her they wished to have her likeness in their home. There were men in that city who knew how to make small idols like Diana with silver. These men were called silversmiths, and they grew rich selling idols to those who wished to buy. One of these silversmiths was named Demetrius. When he heard about the preaching of Paul and about the great miracles Paul performed in the name of Jesus, he became uneasy. Every day he listened to hear more news about this new teaching. And every day he grew more restless; for he feared that soon all the worshipers of Diana would begin to worship Jesus. Demetrius was not so greatly disturbed in his mind because he loved the goddess Diana--not that! But he loved the money he received from those who bought images of the goddess. He feared that soon the people would no longer care to buy the images he made, and then he would receive no more money from them. He could not make images of Jesus to sell, for Paul taught that his God was not to be worshiped as an idol, of silver and gold, or other material. After Demetrius heard that many people had burned their expensive magic-books because they believed in the Jesus whom Paul taught, he became much excited. Calling together his friends who also were silversmiths, he told them about his fears. He warned them about the danger their work was in Paul's preaching. "Not only here in our city," said Demetrius, "but in almost all Asia Minor this Paul has been turning away people from the worship of the goddess, by declaring they are no gods which are made with hands. Not only is our work in danger of falling to nothingness," he continued, "but the beautiful temple of our goddess will soon be no longer visited and admired by people from other lands." Now all the silversmiths became excited, and they began to cry out, "Great is Diana of the Ephesians!" Through the streets they ran, crying these words, and other people followed. Soon the whole city was stirred by the excitement, and some caught two of Paul's companions, and dragged them into the theater. Paul heard what had happened, and he wished to go to the rescue of these faithful companions, but his friends refused to let him do this. They feared the people might tear him in piece if they found him. For two hours the excitement raged; many people did not even know what it was all about, and yet they joined in the cry, "Great is Diana of the Ephesians!" Finally the clerk of the city stepped up before the people and motioned for them to be quiet. He then reproved them for their foolish conduct, and told them they were in danger of being punished for the uproar they had made. 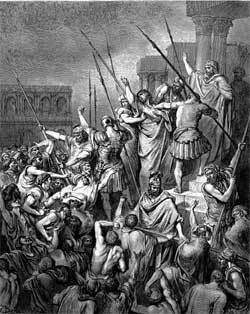 He said that Demetrius and his fellow workmen should not use this means to bring charges against Paul and his friends, for they should handle such matters according to the law of the land. Concerning Paul's two companions who had been dragged before the mob, he said, "These two men had not robbed churches, nor spoken evil of our goddess." He then dismissed the assembly, and sent them all home. Paul had been intending to leave Ephesus even before the uproar was made, as he wished to visit the churches in Macedonia and Greece and then return again to Jerusalem. Now he bade the Christians good-by and sailed for Macedonia. Here he visited the saints in Philippi, where he and Silas had been treated so shamefully and imprisoned, and where God had caused an earthquake to open the prison doors and loosen their bands, setting them free. No doubt the jailer and his household were glad to see this brave preacher of Jesus Christ once more. Passing though Thessalonica and Berea, where he had preached the gospel before, he went on to Greece. For three months he stayed with the Christians in this country, then he prepared to return for the last time to Jerusalem. Before starting he learned that his enemies, the Jews, were planning to catch him and take his life so instead of taking ship and sailing directly to Syria he returned by the way he had come. And thus he escaped once more from the hatred of his foes.